It took me an hour and a half to vote this morning. 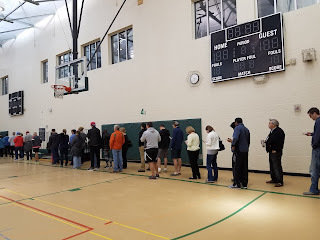 Though I got up at 5:45 am to arrive at the polls as soon as possible after they opened at 6:00, by the time we got there at 6:10 there was a long line already. 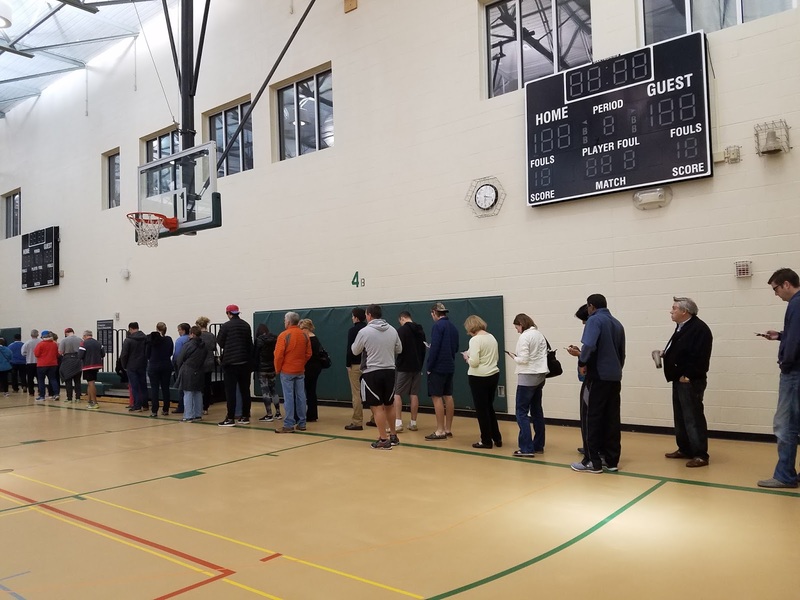 But everyone patiently waited in line, mostly quietly, a few people exchanging greetings with neighbors and friends who passed us to get to the back of the line. We finally finished voting at 7:20, and did not get to our apartment (just across a park) until almost 7:30. This reminded me of the argument by economists that it is irrational to vote. Steven Levitt, of Freakonomics fame (and whose work I generally admire), has said on his podcasts with Stephen Dubner that he considers voting irrational because his vote does not make a difference, and plus, he is not really interested in politics. LEVITT: Well, one good indicator of a person who’s not so smart is if they vote in a presidential election because they think their vote might actually decide which candidate wins. LEVITT: I think the reason most people vote, and the reason I occasionally vote is that it’s fun. It’s fun to vote, it’s expressive, and it’s a way to say the kind of person you are, and it’s a way to be able to say when something goes wrong when the opponent wins, “well I voted against that fool.” Or when something goes right when you voted for a guy to tell your grandchildren, “well I voted for that president.” So there’s nothing wrong with voting. I think you can tell whether someone’s smart of not so smart by their reasons for voting. Standing in line at 6:00 am was not fun. I didn’t see others “having fun” either. Economists build their models assuming a rational Homo economicus and then see how much that model can tell us about the real world. But often, economists forget that their model is a simplification, and they begin to believe that if everyone were rational, like Vulcans, that the world would be a better place. They often assume that smart people are “rational” and that any other “emotional” (i.e. cultural or “irrational”) decision-making is a deviation from some ideal. But that “ideal” was their own model, not a model that any major civilization or religion has proposed. Thus, for economists, since my vote (at the margin) does not affect the outcome, I should not bother to vote. I don’t understand why it does not occur to them, or bother them, that if everyone thought like that, then no one would vote and democracy would be impossible. Economists’ thinking on voting seems to suffer from excessive individualism. Too many economists (and many Americans influenced by this thinking) get upset that their vote does not count. I say the opposite: it is a good thing their, and my, vote does not count much except in the aggregate. Most times, when individuals have had a lot of influence, things have not turned out well (see Stalin, Mussolini, Hitler, Mao, Pol Pot). Freakonomics also had a program about whether presidents really can do that much. They argued, correctly, I believe, that there are strong limits to what the president can do, and though candidates like to take credit for “creating jobs” and for the state of the economy, there are really few things they can do, and they can only influence the economy. This is generally true, although some presidents have made horrible decisions that caused a lot of misery (e.g. Bush’s decision to invade Afghanistan and Iraq), and it is also true that Trump’s economic plan could seriously derail the world economy if he started a trade war. Economists have an overly individualistic view of society. They assume human nature is selfish and individualistic, but human nature is also political, social, and moral (see Wilk and Cliggett). People may vote because it gives them some satisfaction, but they also vote because it is socially expected, and because they want to help make a better world (i.e. moral and altruistic reasons), and because they were taught by their parents and school that it is the right thing to do. Economists seem not to get this. They see society as just a collection of individual preferences, a view that let to Margaret Thatcher’s infamous comment that there is no such thing as society, just individuals. The same individualistic assumptions have led many Americans to believe that it will take one person to change the system. Trump has said, “OnlyI can fix it” at the Republican National Convention. Aside from the hubris and braggadocio, the notion that one person can change a whole system is laughable. And this is leaving aside the fact that Trump has no political experience (so would not be able to get legislation he wants passed), and that he has not specified what the new system will be like. His appeal is the classic one of a demagogue. It is actually a sign of a mature democracy that one individual has limited power. Authoritarian leaders in recent history that have had a lot of power have caused catastrophes. Trump could do a lot of damage to American institutions, and to the world economy, but he would have many brakes on his power. He would be frustrated, but that is a good thing. Obama disappointed many by not revolutionizing America, but he was very clear that his power was limited and all he could do is move the country gently in what he considered a positive direction. The benefit to limiting autocratic power is something many Chinese, Russian, and Philippino advocates for authoritarian government may come to learn. In the meantime, it is important to vote, even when the system is not entirely fair. No human system is totally fair. Taiwan’s biased elections (biased in favor of the KMT until the 1990s) created a foundation for real democracy. No one person’s vote will make a difference in any election, but collectively, each vote does make a difference. Only economists don’t see that.